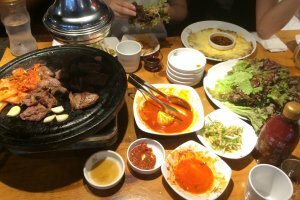 Korean barbecue and a korean-style cheese and shrimp pancake are the highlights of this meal in Shin-Okubo. 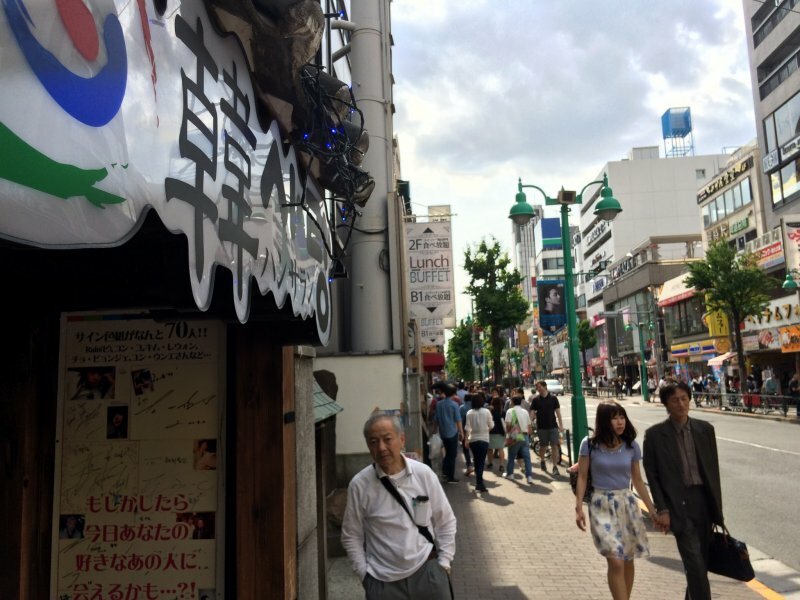 Close to the Shinjuku area is an exciting change of scenery from the regular Tokyo spots: Shin-Okubo. 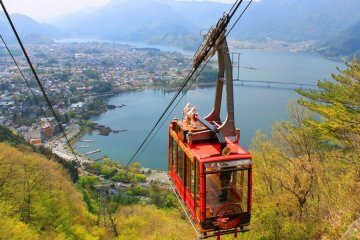 Tokyo's 'Korean Town' is not just for those obsessed with the pretty faces of the Korean Pop world. 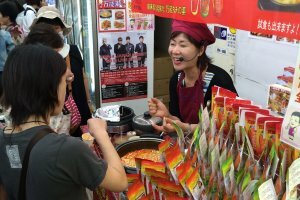 Actually, the small but vibrant area in Shin-Okubo boasts a ton of street food, karaoke, markets, restaurants and bars that show off the South Korean vibe and way of life. 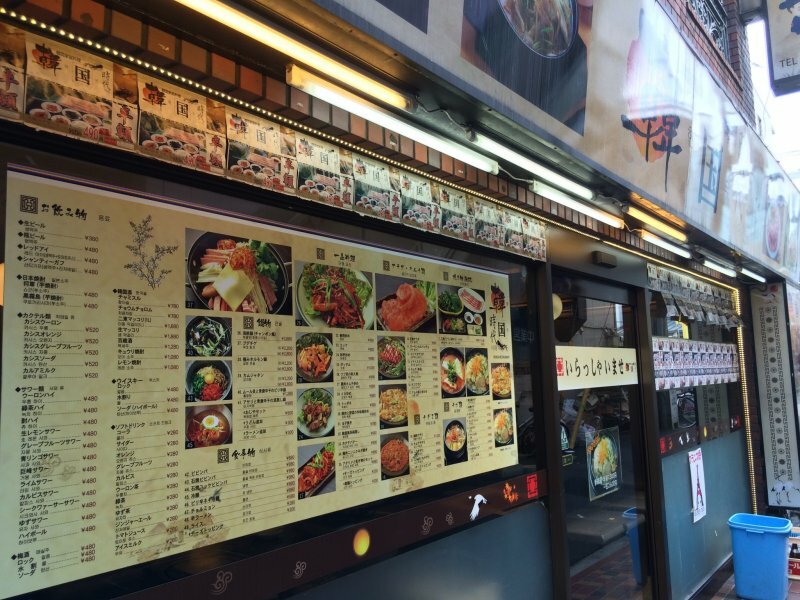 I discovered Tokyo’s Korea Town after returning from a week-long trip to Seoul, South Korea. But, you don’t have to be familiar with the country to enjoy it. Korean street food is cheap, plentiful and super tasty. 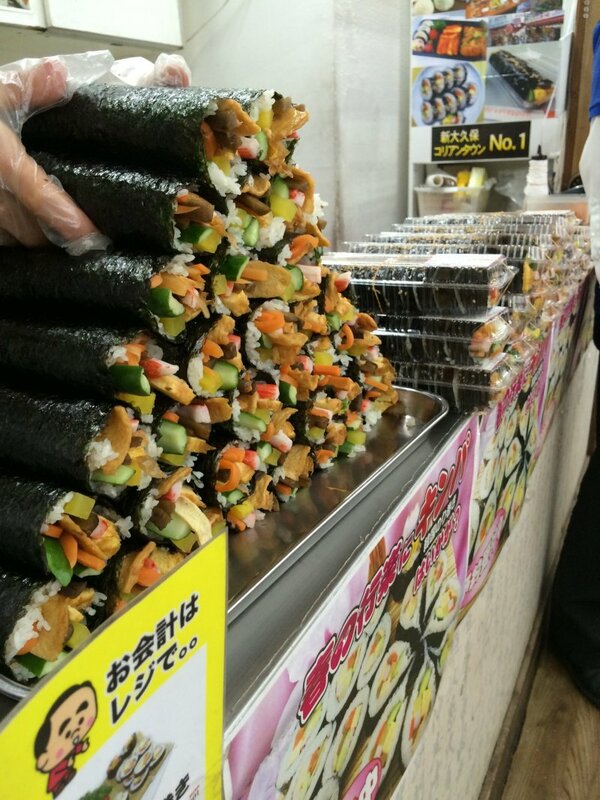 And if you've been looking for more spicy food, this is spicer than Japanese food. Try the Korean-style sushi or the Korean-style pancake that comes in many flavors and are similar to okonomiyaki (Japanese savory pancake.) 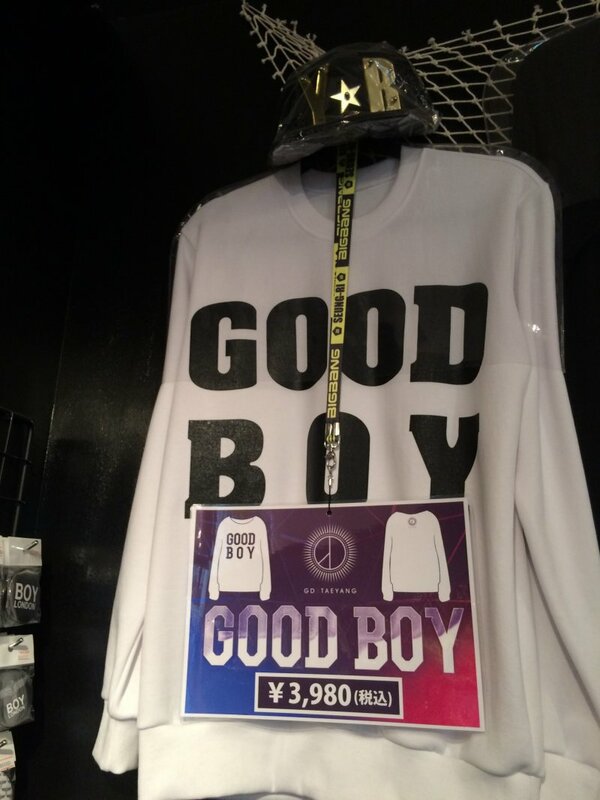 Prices range from about ¥200–600. Get ready for a lot of meat. OK, I’m sure you’re ready, but, get ready for a lot of thick meat. 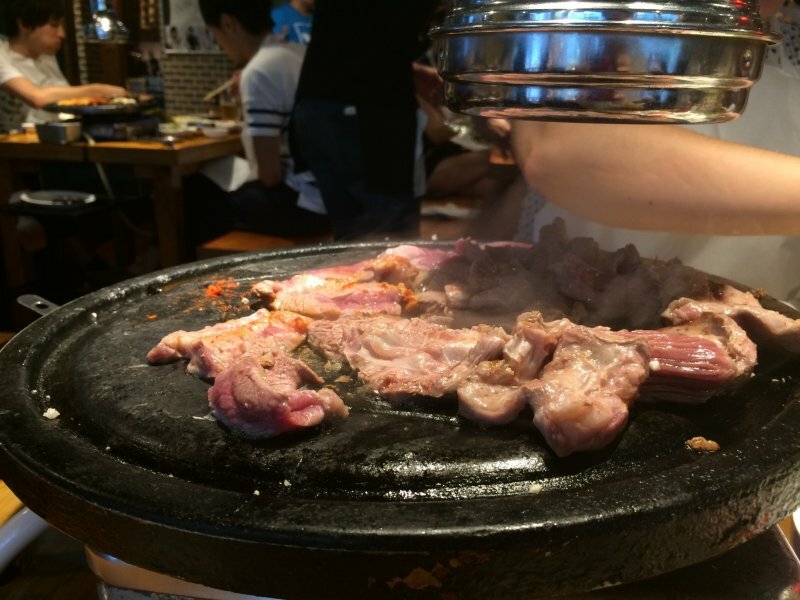 Korean barbecue often has thicker cuts of meat than Japanese-style yakiniku (grilled meat). Pork Belly is a favorite. Also, one can enjoy Korean-style pickled vegetables and salads that come with the meal. You will cook the meat on a grill that’s on your table. Depending on the restaurant, the server may cook it for you. I cannot express the surprisingly euphoric situation that is Korean fried chicken. As someone who rarely, if ever, ate fried chicken, it comes highly recommended to both fried chicken lovers and novices. The crispy, greasy goodness of Korean fried chicken will make you hate KFC for having tricked you into thinking that what they serve is fried chicken. The fried chicken places almost always have a chicken on the front of the restaurant. Go. There. Korean Karaoke / Clubbing There’s nothing too crazy going on here. Wait, yes there is. 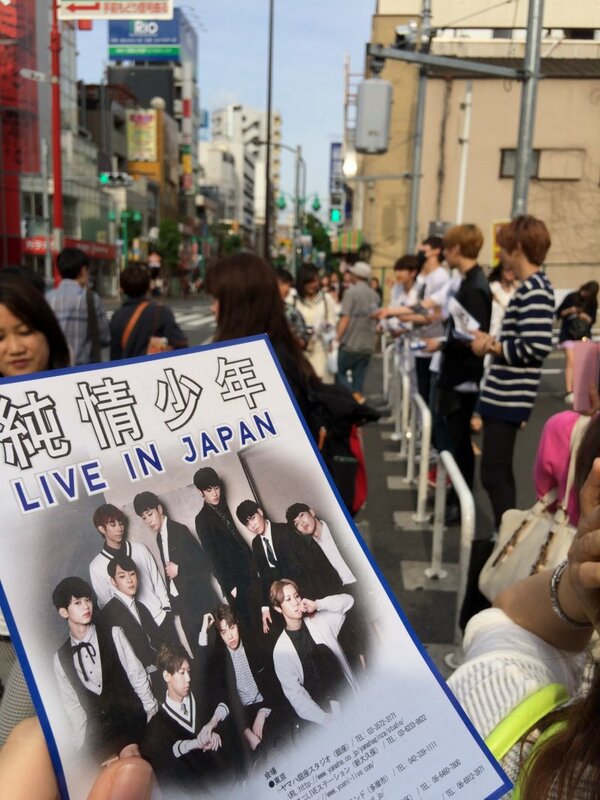 Those who love K-pop can go to clubs and karaoke bars dedicated to just that. 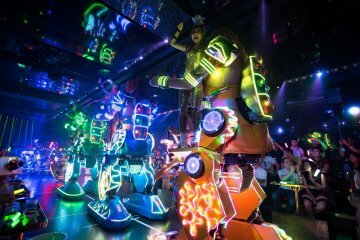 For example, "Bar Blue" has K-Pop nights, with a cover charge of 2,000¥ (women) or 3,000¥ (men), including two free drinks. 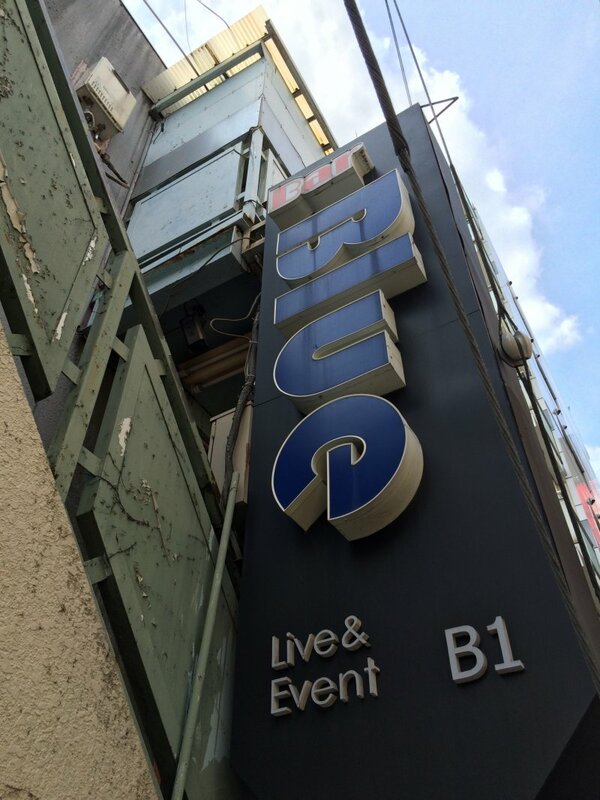 Next, you can drop in at the Big Echo karaoke complex just outside Shin-Okubo Station and rent the K-Pop room. It shows projected videos of featured K-pop bands and and life-sized photo stickers of the band members, for a limited time. When I checked it out, BTS, a Korean rap/pop band, was the featured band from February to August, 2015. If that doesn’t interest you, there are many other karaoke venues in the area, too. 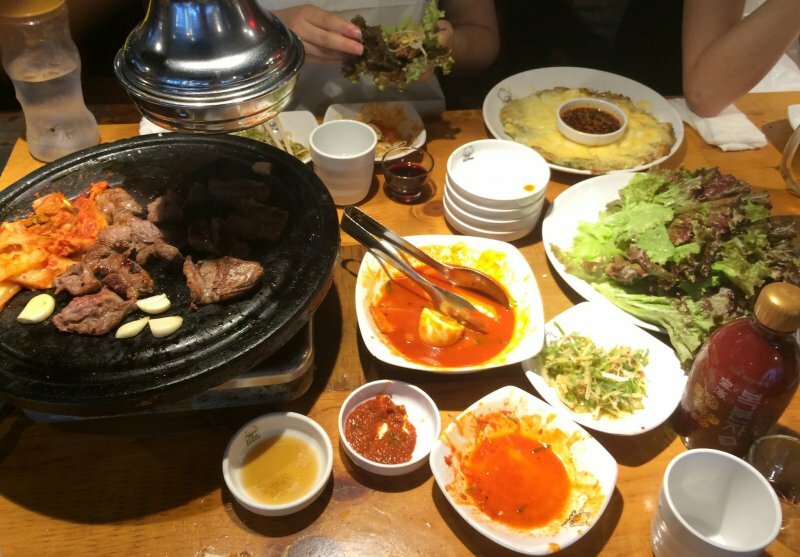 Try some new foods and do some Korean cooking (and drinking, ya’ll!) at home after visiting one of the many Korean markets in Shin-Okubo. 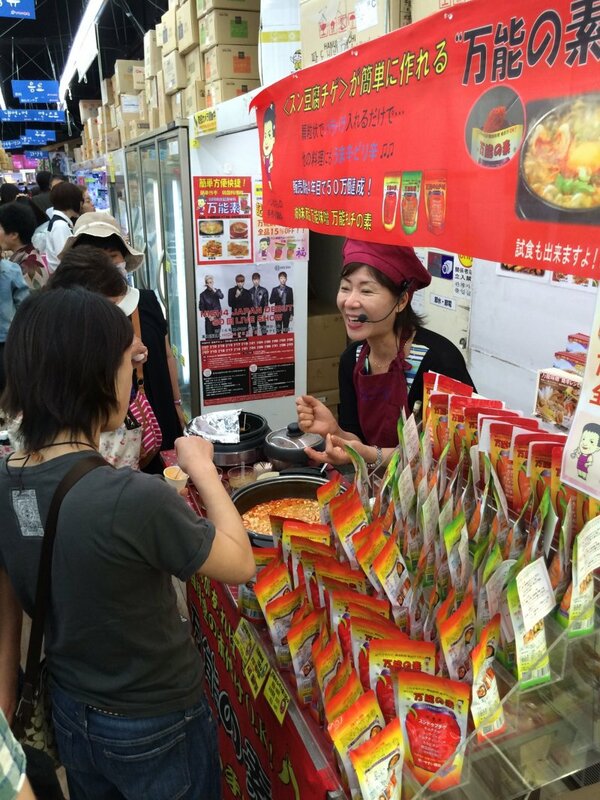 They have a lot of Korean ingredients and pre-made foods for cooking. But, they also have Korean alcohol. 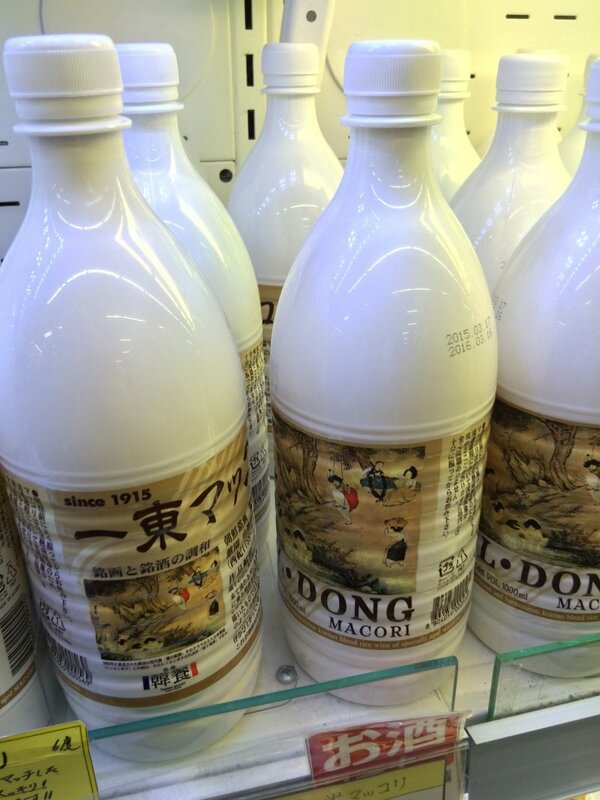 If you’re like me, and constantly have a hankering for Korean rice liquor, you can get your fixes for that and much more! 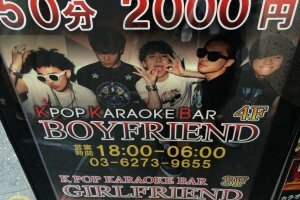 Of course, the bars in Shin-Okubo are more likely to serve your favorite Korean alcohols and drinks, but you can also go to a “Boyfriend” or “Girlfriend” bar. 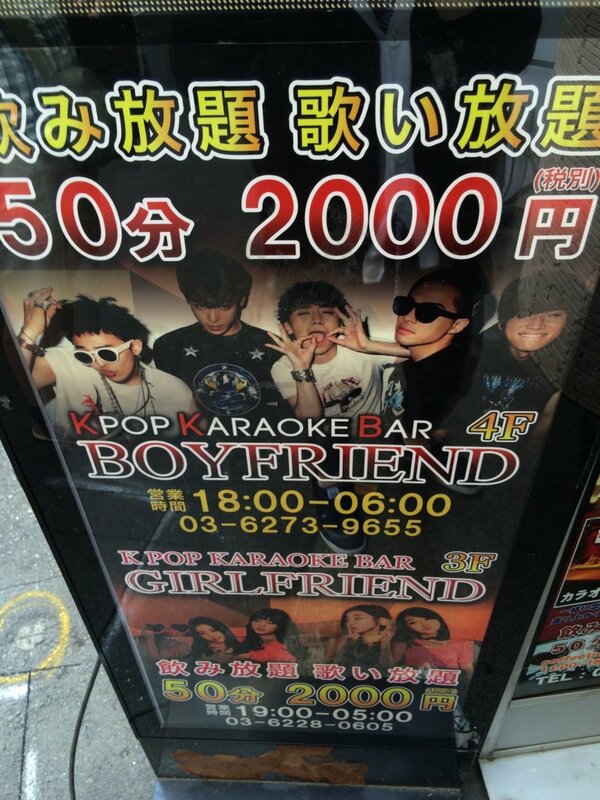 For 50 minutes, you can sing karaoke or converse with the boyfriends/girlfriends at the separate bars. I could say more, but I'll let you "read the air" on that one. 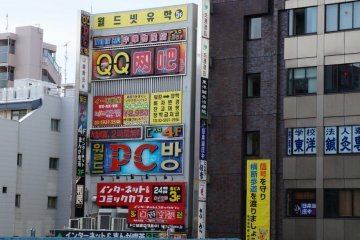 Korea, like Japan, is famous for exclusive beauty brands and products. 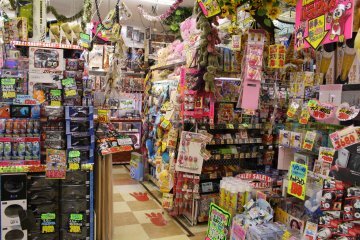 Just walking down the main street, you’ll find tons of face masks, lotions and makeup with plenty of testers to try stuff out if you aren’t sure what you want. Full disclosure: During my trip to Korea, I quickly became fascinated with everything Korea. 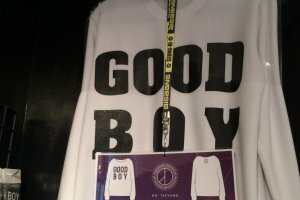 From the food, to fashion to the … boys. Ah, hem. So, yes, that was a slippery slope into K-Popdom. (Happy to say) now I’m a recovering addict from the vast world of seemingly endless cute faces, flashy dancing and disturbing amounts of posters, mugs, clothes, calendar planners, photos, towels and … I could go on. But, I really shouldn't. 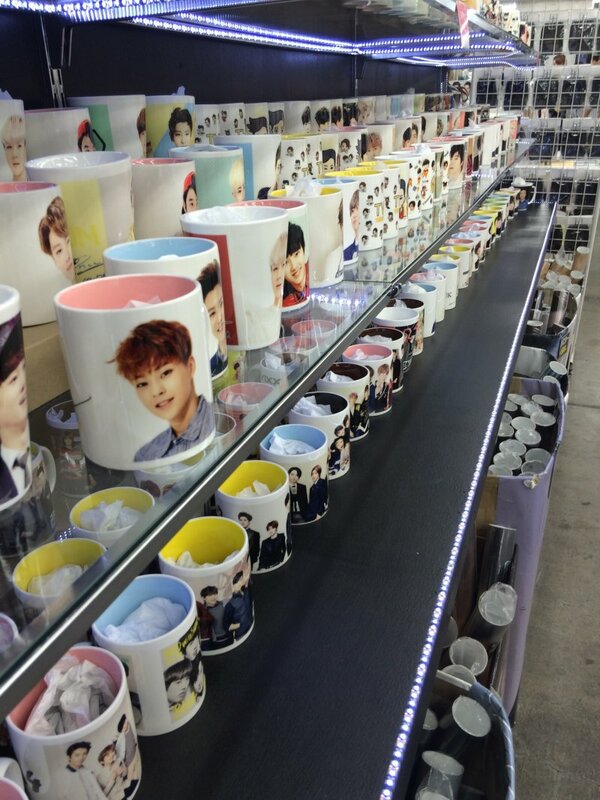 You’ll find K-Pop shops, from small to large ones, which are lined from wall to wall with K-Pop paraphernalia. 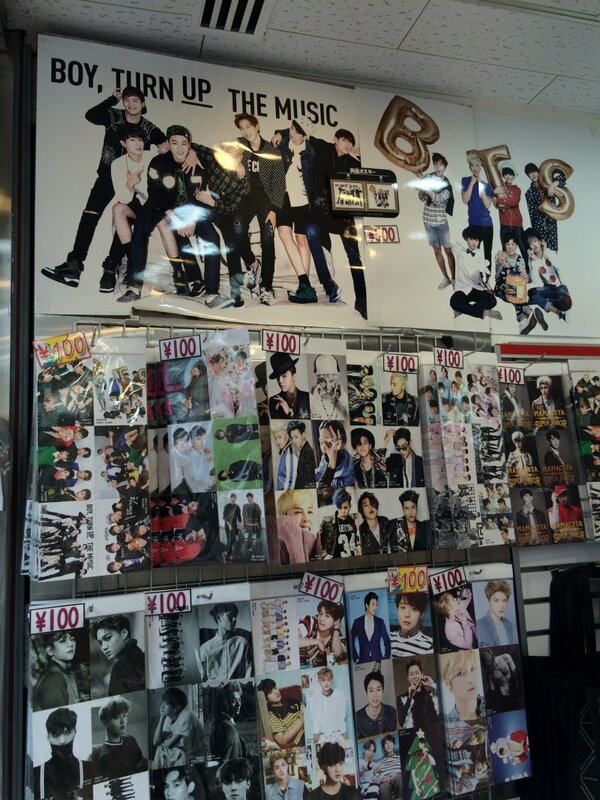 There has to be more than 10 K-pop stores in Shin-Okubo, with every type of gimmick you can think of. Why? Because K-pop. Even if you aren’t into K-Pop, it’s still a complete spectacle (some might say freak show…) to take in. Enjoy coffee, a parfait or cake while watching and listening to K-Pop. The cafes have huge TV screens playing your favorite anthems! 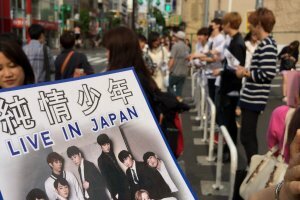 Often there are bands (who are trying to make it in Japan) hanging out on the street advertising fliers for their concerts. After going beneath the underpass to the right of the station, there is a small parking lot where you can find them. They’re what you might expect: fashionable, too pretty, and (possibly) talented. Grab a flier, go to a concert, and you be the judge. 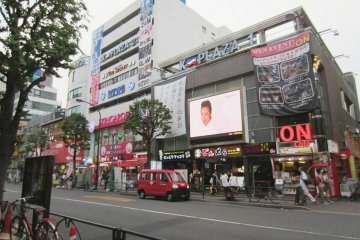 Japan’s Korea Town is located in Shin-Okubo, near Shin-Okubo Station, on the Yamanote Line (JR). 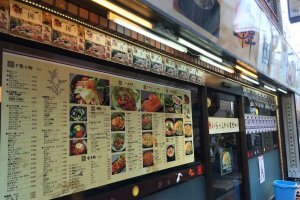 It’s close to Kabukicho, Waseda University and Takadanobaba. To get to Korea Town, simply take a right after exiting the station and walk down the main street. Give it a mere 30 seconds, and you’ll be there. Enjoy, but as I learned, pace yourself! 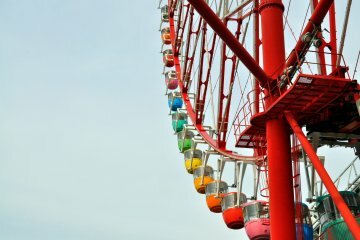 Daikanransha Ferris Wheel in Odaiba.. There's been a flurry of bubble tea shop openings in shin-okubo. What's everyone's favourite Korean chicken shop? I don't know which to choose! 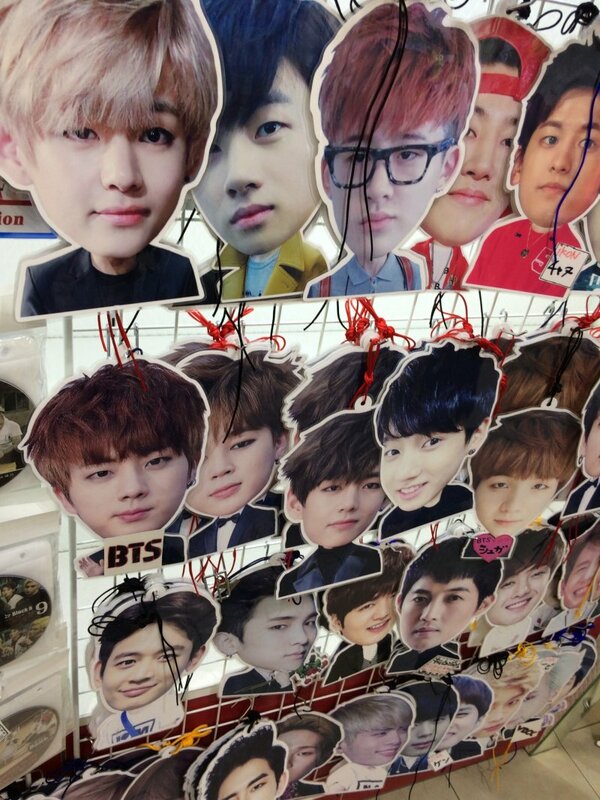 Shin Okubo is a great little place. 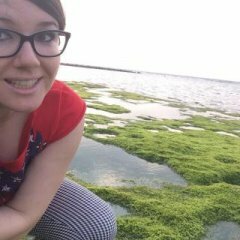 I love Korean cosmetics - there are so many great and reasonably priced products! 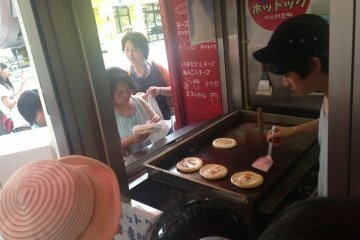 Just one good reason to visit this part of Tokyo!